A hand-coloured print of Bishop's College, Calcutta from the Fiebig Collection: Views of Calcutta and Surrounding Districts, taken by Frederick Fiebig in 1851. Bishop's College, was established in the early 1820s by the first Bishop of Calcutta, Thomas Middleton. It was a part of a scheme for a theological college along the lines of that at Cambridge. It contained a chapel, houses, library and lecture rooms. 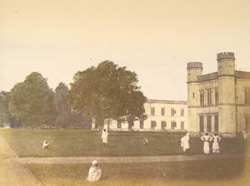 It later became the Calcutta Engineering College.